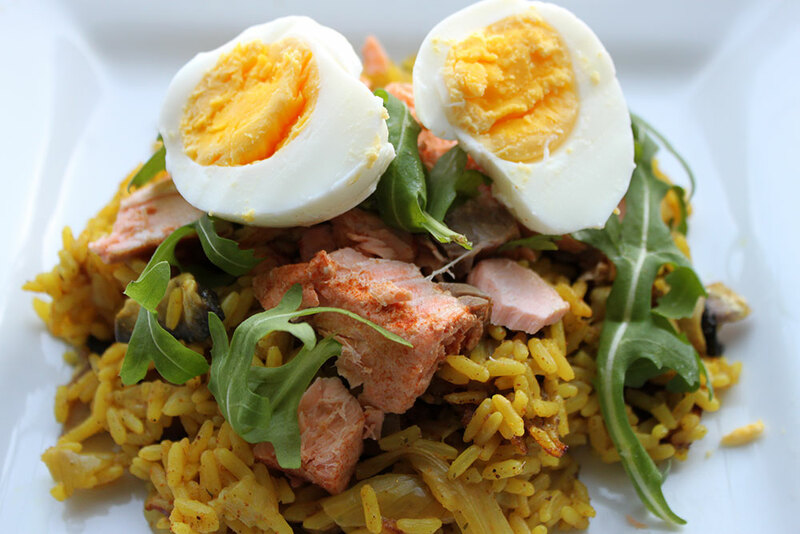 A couple of weeks ago I came across this Kedgeree recipe (you should have a look at this blog anyway, it has lots of wonderful recipes and beautiful photos). Kedgeree is a recipe where all my current food loves combine to make one perfect recipe: contains fish, with indian food and spicy curry flavours and some new aspect to it to broaden my cooking horizons. Embarrassingly enough hard boiling an egg is expanding my cooking repertoire, and once I realised this, well you can’t give up. You can put it off for a week or two, but in the back of your mind you know you are avoiding the most simplest of tasks. On Friday night after having a quick look at Delia’s how to boil an egg instructions – I boiled my first egg. By Coffee Muffins inspired by this Kedgeree recipe. This spicy dish is traditionally a breakfast dish, but is wonderful at lunch and dinner too. 1 1/2 cups of rice, I used basmati. 250 grams of salmon fillets. 2 tablespoons of medium curry powder, this made quite a spicy dish, use less if you wish. 1/2 a fennel bulb, finely sliced, optional. 6 button mushrooms, sliced, optional. 1 handful of fresh rocket leaves, optional. 1 vegetable stock cube, optional. Fill a medium pan with boiling water and under a medium heat add the salmon fillets to poach. Poach until they are cooked all the way through and flake easily, it should take around 10 minutes. Next you will have to hard boil your eggs. You can do this whatever why you would normally boil an egg. I added cold water to a small pan, used a needle to create a small hole in the bottom of each egg (to stop them exploding), and added the eggs to the pan. Turn the heat on under the pan and once it reaches boiling point time for 7 minutes. While the salmon is poaching, saute the onions and fennel in a little cooking spray in a saute pan (or frying pan with lid). Once starting to soften add the curry powder until throughly coated. Add the rice and mushrooms cook for a couple of minutes under the heat. Dissolve your stock cube into 2 cups of water (480ml) and add to the rice, stir well to ensure nothing has stuck to the bottom of the pan. Then place the lid on the pan, it should take around 20 minutes (although it will largely depend on the type of rice you use). Once the salmon has done, drain it and keep it warm. Once the eggs are done immediately put them under the cold tap, and let them cool for a couple of minutes (ideally as long as you can) this makes them easier to peel. Tap each egg to break the shell and peel it off, trying to keep as much of the egg intact. Quarter each egg and set aside. Once the rice is finished and cooked through. 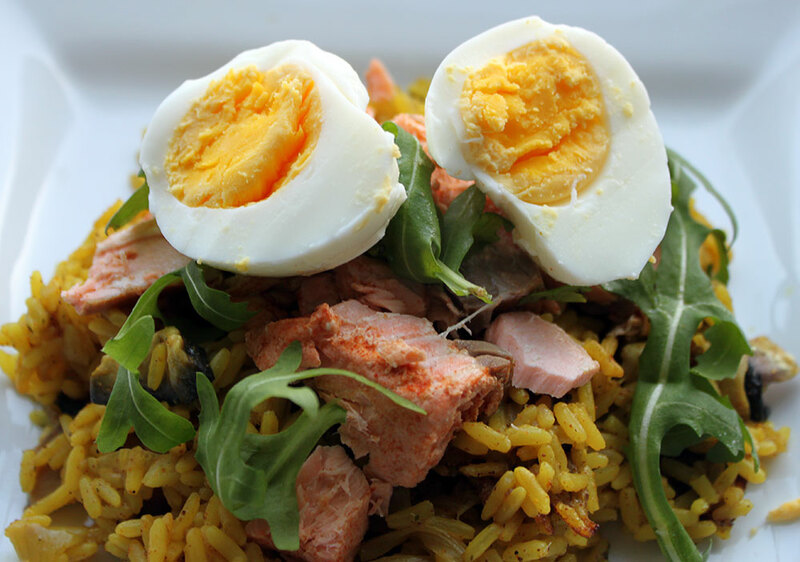 Ladle the rice onto plates, topping with flaked salmon, quarters of egg and rocket leaves.